Oleksandr Usyk continued his incredible career with an 8th round stoppage against Tony Bellew to retain his undisputed crown. Although a disappointing result, it was a momentous occasion for British boxing. The first ever undisputed fight to take place on these shores, and it certainly did not disappoint. Last night at the Manchester arena we were all hopeful that Tony Bellew could make history. It was an imperious start from the Liverpudlian. After 4 rounds it became clear that this was a much more technically competitive fight than many people anticipated. Bellew was boxing smart on the back foot, beckoning Usyk to fall in to his traps, and by the time of the stoppage he was up on 2 scorecards and drawing on the other. Doubt started to creep into my mind; Could bellew win this fight on points? Has Usyk underestimated Tony’s skill and guile? Or was this just a masterplan by a boxing genius? It was captivating beyond my expectations, enticing beyond thought. These unexpected, unanswered questions took the fight to new heights, as an already inspiring narrative took a twist in a way that couldn’t even be scripted. As the 7th round approached, it was clear that the Ukrainian started to get into a boxing rhythm. Bellew’s body language was changing, his movement was becoming slumbered, and his punches were becoming more erratic. Uysk started smiling through his gum shield as the unfortunate inevitability was about succumb. Tony knew he had to go for it. as the 8th round bell rang, my optimism slowly dwindled away, as I realised we were witnessing something truly special. The 8th round came upon us. The mental pressure that was exerted on Tony was beginning to show. The bomber was getting clipped by Usyk’s excellent jab with more regularity, and then, all of a sudden, a breathtakingly set up left cross pulverised Bellew to the canvas in frightening style. It was unbelievable that Tony got up after that shot, which really just demonstrates the heart and warrior of the man. He was unable to continue and the fight had come to a spectacular end. 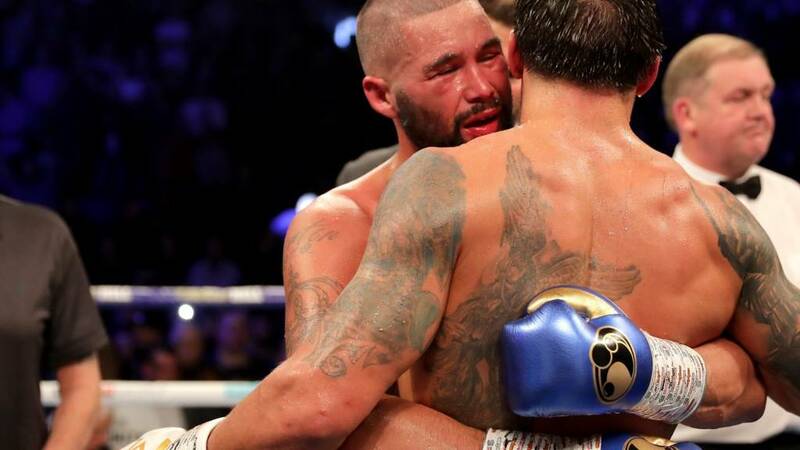 Ultimately, it was a disappointing night for the Liverpudlian and British boxing fans alike, but we should all be extremely proud of Tony Bellew. He had come up against greatness, a genius, a maverick, a boxer that is immensely talented beyond description. And he outboxed him for 6 rounds… a man who lost to Nathan Cleverly and Adonis Stevenson, a man who has had to completely reinvent himself, a man who’s career was genuinely on the line only a couple of years ago. What Bellew did last night was remarkable, he did not lose last night, even though thats what the record will state. British boxing has never seen a fight like this; undisputed fights are so rare due the politics that hamper such events. Tony could have fought Dillian Whyte for more money, but he dared to be great, to do the unthinkable. In that sense we owe an extraordinary amount of gratitude to the man, he will be sorely missed. It was a emotional night for all involved. Although Usyk was victorious, this night was about Tony Bellew. We thank you for a career that will never be replicated.